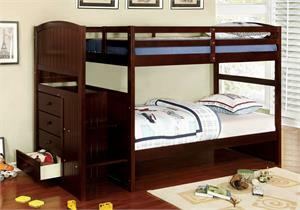 This rustic styled bunk bed is an unadorned beauty. The wooden grain shines in all of its glory along the plank styled headboard and footboard ladder rungs as well as the side guard rails. This set takes the motto "less is more" and runs with it. This is the perfect piece for a cottage or farmhouse style home Decor.